In our last blog post we gave you some effective ideas for a quick kitchen facelift. If you’re in dire need of updated kitchen finishes but don’t have the time, money, or patience for a full-on kitchen remodeling project, then here are a few more ideas for giving your kitchen an updated and chic look. Updating the lighting in your kitchen is an excellent way to freshen up your kitchen without getting caught up in a kitchen remodeling project. While you may not realize it, the lighting in your kitchen can make a huge difference in how your kitchen looks and feels. You can easily change out old fluorescent lighting boxes and replace them with recessed lights. Or you can also choose to install pendants over islands or other key focal points in the room which will achieve a better-lit, better-looking space overall. You may also want to try under-cabinet lighting which can help to shed better and more attractive light on your work areas. Flooring can also help to enhance the functionality of your kitchen and make it look great too. There is an array of materials to choose from including comfortable cork or durable porcelain. When choosing your new flooring, just make sure to consider how it will look with your kitchen’s current finishes and if the material corresponds with your lifestyle. As mentioned in our previous blog post, one of the most crucial elements of any kitchen is the kitchen cabinet doors. If you are happy with the current layout of your cabinets, but are looking to freshen them up or replace them, consider cabinet refinishing rather than a purchasing all new cabinets which can cost a fortune. For the highest quality cabinet refinishing or refacing, contact the experts at Summit Cabinet Coatings. Also, when giving your kitchen a facelift, it’s important to factor in the design elements found through your entire home. You want your updated kitchen to mesh well with the rest of your home, therefore consider the architecture, flooring, and built-ins located elsewhere throughout your home and choose finishes and materials that compliment these. 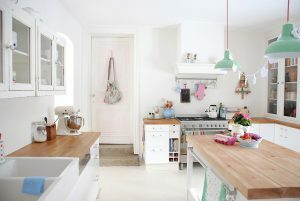 Giving your kitchen a fresh new look doesn’t have to mean getting involved in a full-blown kitchen remodeling project. Instead, you can choose a few elements and give them a facelift by refinishing or refacing or paying attention to small elements that can make a big impact.